This thread will be used to compile information specific to the most recent FastPass+ changes in My Disney Experience, particularly related to the most often discussed topics: park hopping, checking availability and obtaining multiple tier 1 attractions. We hope to keep this information fluid with additional changes and/or updates that continue to be rolled out; however it is my intent to keep the first few posts updated with the most current information. Thanks to all who help to keep this info current, especially @mesaboy2, @hiroMYhero and @marciemi!! Amanda999, The13thLetter, BikeFan and 5 others like this. You don't have to Cancel when checking availability, rebooking a new park, or when park hopping. Simply follow the instructions below. ~ you won't lose anything if just checking availability. After checking, back out of the window and your original FP+ remain. ~ when you confirm a FP+ for the new park, that's when any original FP+ are replaced. * The system does not show ride availability for time slots that are blocked by original FP Return Windows. Remember to grab a chosen ride’s available FP and then “Modify + Refresh” to find other available times. Ninja Mom, The13thLetter, anita46 and 4 others like this. There are several ways to make a second Tier 1 FP+ within the same park. Most important to know though, only booking 1 Tier 1 (and no Tier 2’s) will NOT allow you to make another Tier 1 FP+ once you use the first one. You will get a message telling you that you are limited to one Tier 1 a day. So you have to “use” the Tier 2’s somehow. Obviously, if you have an interest in using the Tier 2 rides, you can simply ride 2 Tier 2’s. Once you have scanned at the third ride (in whatever order), you can then book another Tier 1 if available. However, at Epcot especially, all the good Tier 1’s can be gone early in the day and the Tier 2’s frequently aren’t necessary to use a FP+ for. So your goal may be to be able to make a second Tier 1 as early in the day as possible. As you walk in the park, scan the band immediately at Spaceship Earth right at 9am as you work back to (let’s just say) Test Track. As you walk (or while you wait), try to then move the Pixar Films FP+ to around 9:15-10:15. After TT, walk by Pixar and scan there as you head to Soarin’. In this case, as soon as you scanned at Soarin’ at 10:15 (5 minutes early is allowed), you could attempt to book a second Tier 1 for (for example) Soarin’ again later in the day. If you hadn’t been able to move the Pixar earlier (to before Soarin’), you could try again as soon as you scanned at Soarin' to move it to as soon as possible. So again if you scanned there at 10:20, you might be able to get a 10:45 which you could go tap at right after riding Soarin’ and book the next Tier 1 at that point. But what if you don’t want to deal with riding or tapping at Tier 2’s at all? The other alternative is to simply schedule your two Tier 2’s before your Tier 1 and let them expire before you get to the Tier 1. This would allow you to book another Tier 1 as soon as you tapped at the first. This option is particularly useful for the Frozen Ever After FP+’s (which begin at 11am). So you could schedule two at 9am and 10am and be eligible for another Tier 1 as soon as you scanned at FEA. During this time, you could sleep in, ride some of the Tier 1’s with shorter lines then (whether TT or Soarin’), or even begin your morning at another park with EMH before hopping to Epcot. HOWEVER, it is important to use the correct method illustrated in post #5 below in order to do this. You simply can’t just cancel your Tier 2’s (or it will reflect you didn’t have them) or attempt to use the “Modify” option on MDE. You must book these FP+s as if they were new FP+s for the day. I have tested this multiple times, both at Epcot and HS, using both AP’s and MYW tickets and they all follow the same steps. The example in post #5 is from HS, but you’d do the same for Epcot. mainelyj, The13thLetter, anita46 and 6 others like this. With the new updates to the FP+ system as of April 2016, in addition to booking your 4th FP+ of the day on your phone (instead of a kiosk), you can now book FP+ for a different park than the one you’re in. If you have booked 3 FP+ for the first park, as soon as you scan at the first touchpoint to get in the FP+ line for your third FP+, you can then make a 4th FP+, either for the same park, or for another park. Be sure to allow yourself enough travel time for travel between parks when selecting your time. Additionally, the new changes allow you to book fewer than three FP+ and once you scan the first FP+ (from within the first park), you can at that point make FP+ selections for a different park, even if you still have a FP+ remaining in the first park. This can be especially helpful for Tiered parks – if for example you wish to hit Epcot at rope drop, use only a Tier 1 FP+ and then still have 2 more FP+ for another park later in the day. Additionally, there is no restriction on Tier requirements BETWEEN PARKS during one day. So if you use a Tier 1 at Epcot you can then book a second Tier 1 at HS immediately upon scanning – Also, you can even book your remaining two FP+ at two different parks if you would like! NOTE: Splitting FP+ between parks or booking for another park can NOT be done until the same day, AFTER you have already scanned your card/MB at the first FP+ Mickey head to “prove” to the system that you’re in a park. You cannot book for 2 different parks in advance or even on the same day until you have scanned your first FP+ (not just gotten into the park). The13thLetter, anita46, Amanda999 and 6 others like this. (Ignore the second Star Tours which was for Eric only). It then showed me available FP+, but also gave what could be interpreted as an error message telling me “You may only plan 1 of these per day” in regards to the Tier 1. (Note the Tier 1 I was still in line for still showed at this point, but would disappear shortly, and “Eric’s” Tier 2 still showed below). Next I tested booking a FP+ from one park while in another – see post #6 below! The13thLetter, anita46, Amanda999 and 4 others like this. So at this point Eric was physically in Hollywood Studios and had already booked FP+ for both MK and Epcot for later that day. In general, I would recommend booking FP+ even if you’re not sure if you’ll use them as you can always cancel them and book for another park if you decide to do so. If we had wanted to do Star Tours and the line was long, he could have used that FP+ and still had the 3rd for another park already booked. If it was a short line or we were ready to leave HS, he could then just cancel that FP+ and book, well in advance of his arrival at another park. These recent changes to the system allow for a lot more flexibility in current day planning – you could even decide whether or not to hop or where to hop based on what FP+ were available at that time. Also, one final note that if you had already booked 3 FP+ in your first park and wanted to book the 4th for a different park, your screen would look the same as in the second picture in this thread and you would select View Eligible Guests and continue in the process exactly as shown above. Bmh4796, The13thLetter, anita46 and 3 others like this. When the 60-day FP Booking Window opens for an onsite stay of longer than 14 days, you'll be able to book up to a maximum of 14 consecutive days. After this, your ability to book for additional park days continues with each passing day. The open 60-day Booking Window continually rolls forward each day allowing you to book for your total number of onsite park days. Greg36, The13thLetter, anita46 and 2 others like this. Mrs. W, The13thLetter, Merida43 and 5 others like this. You must use (or allow to expire) your initial 3 FPs before you can book FP#4. You’ll be able to book FP#4 even if you are saving your Anytime FP to use later in the day. dnllmz and The13thLetter like this. Wow!! Thanks for all your hard work! Such a great source for all DISers! Sticky status, too!! Bmh4796 and Cluelyss like this. FoxC63 and Cluelyss like this. Awesome tutorial, @Cluelyss !!! Thank you for your time to write it up! Thank you buddy! Hopefully others will see and appreciate all your hard work! This post is so easy to understand. I told people (MNSSHP) they could have FP+ at two different parks on the same day and oh, was it crazy, people didn't even know the FP+ system was updated. How can they not confirm this information? They're willing to spend thousands of dollars on a vacation but not bother looking things up! Ugh! Sorry buddy, rant over, haven't had one of those in like forever! Delete me at your whim! Feel much better. Thank you! MinMou, Cluelyss and hiroMYhero like this. Wow, this is really helpful. I had to make my FP's this morning - on our last day we are spending the morning at EP and then hopping over to MK to finish out our trip. Right now I have FP's for TT, then Nemo, and then TAlk with Crush...I shouldn't really NEED the ones for nemo and crush, right? So could I cancel those that morning, and then right after we get on TT schedule a same-day FP for MK? Am I understanding that correctly? You actually can Cancel them because you won't need them. As soon as you enter the FP line for TT, go on the app and schedule 2 FPs for MK. If I only book one FP ahead of time and then decide to cancel it while I'm at the park, would I then be able to make all 3 FP at another park since I never used a FP at the first park? Example: I book a FP for TT at Epcot 60 days in advance. I plan on arriving at rope drop to ride it, but in case we get there late, I wanted to have a FP. We then plan on going to MK for the rest of the day. So if we actually do make it to rope drop, I would cancel my TT FP. Could I then make 3 FP for MK since I never technically used any FP at Epcot? Thanks! I hope I explained that well enough. Yes, as long as you never tap a FP at Epcot you could cancel and book 3 at MK. 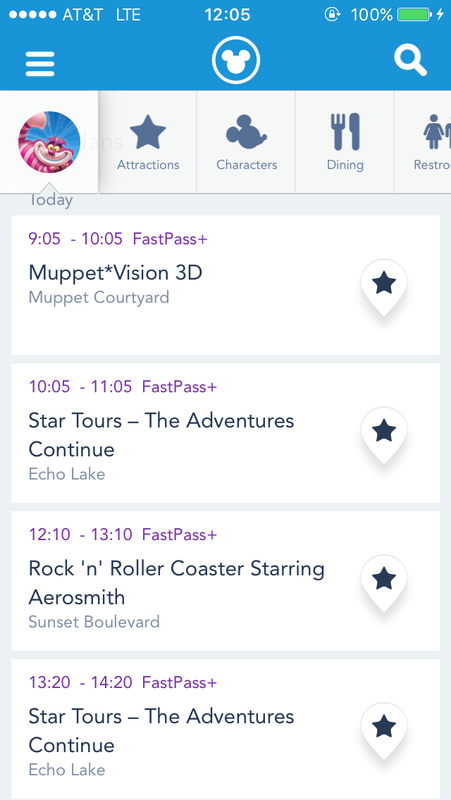 If you end up using the TT FP, you can schedule 2 at MK as soon as you scan your band at TT. hiroMYhero and JackieT1182 like this. The valid theme park admission associated with your Site/App account and used to make FastPass+ selections must be the same valid theme park admission that you will use for entry into the park on the day the FastPass+selections are redeemed. This does mean that discussion of booking or using FPs using ticket media that will not be used for admission into the parks (extra tickets, APs belonging to others, FPs for family members who decide not to enter a park, etc.) will not be allowed as that would be circumventing Disney TOS. DISfirefighter and Cluelyss like this.